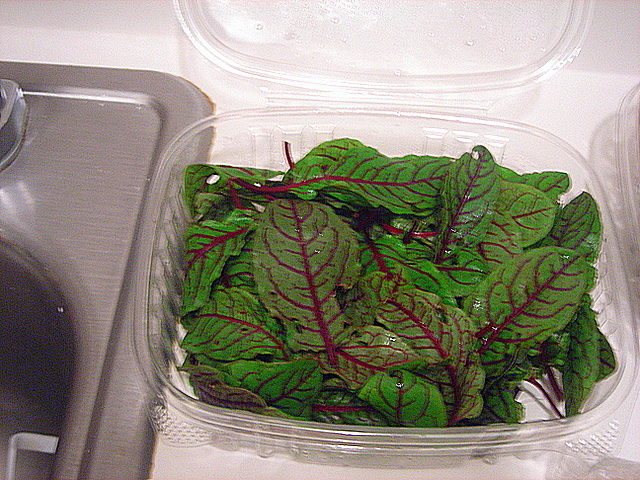 Here’s some red sorrel I bought a couple weeks ago. I’ve been using it in mostly salads and pasta but I want to do something else. Got any ideas? After a weekend filled with BBQ PORK, I’m ready to return to reality. Not sure yet what’s for dinner but it’ll involve something with cauliflower. More later. 09 Jun	This entry was published on June 9, 2008 at 12:28 pm and is filed under food, general. Bookmark the permalink. Follow any comments here with the RSS feed for this post. Hmmmm. I’ll have to get back to you on that one. All that comes to mind for me is sorrel with peas. Which is delicious mind you. I’ve never seen red sorrel! I use it anywhere spinach or chard might work. While I like your char, and want to start using more miso on fish, my first thought would char with a sorrel sauce.